Home » Editor's Choice » ROR: How Big Does a Super Dwarf Retic Get? ROR: How Big Does a Super Dwarf Retic Get? YouTube - How big does a super dwarf or dwarf reticulated python get? The size question is probably Reach Out Reptiles’ most frequently asked question about retics. 50% SD? 75% SD? Kalatoa/ Madu/ Karompa/ Kayuadi/ Jampea/ Selayer…. what does it all mean? There are more variables in small reticulated pythons than you may have realized, and there is not a straightforward answer. 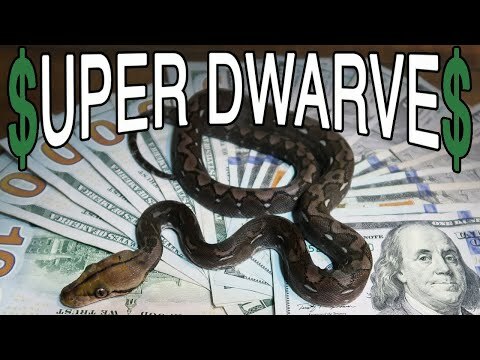 Many people have had such bad experiences buying misrepresented super dwarf and dwarf retics that they are beginning to believe these creatures don’t exist except in marketing fairytales. Garrett Hartle does his best to explain some of the things you should know before you buy a baby reticulated python. ROR: How Much Does a Super Dwarf Retic Cost? Reptile Forums UK - A reptile breeder in the UK shares pictures of their hatching lavender super dwarf and possible brindle albino super dwarf reticulated pythons. Ball-Pythons.net - Take a look at the awesome reticulated python babies that Ground Breaking Reptiles produced, including a super dwarf snow. Ball-Pythons.net - Here are some nice pictures that illustrate very well the size of a female super dwarf reticulated python. Some good info on her temperament is given, too. Ball-Pythons.net - Take a look at this fantastic looking super dwarf ultra ivory reticulated python after a fresh shed.